Rabbi Ovadia Yosef's daughter says lack of English, Mathematics is a serious obstacle to helping haredim enter higher education. 3/14/13- by Jeremy Sharon- Adina Bar-Shalom, the eldest daughter of Shas spiritual leader Rabbi Ovadia Yosef, said on Tuesday that the lack of English and Mathematics education in haredi schools was a serious obstacle in increasing the numbers of haredim in higher education. Bar-Shalom established the Haredi College in Jerusalem, the first academic college for haredi men and women in Israel, where students can study for degrees in numerous fields such as computer science, medical science, psychology, social work and others. Speaking at the first meeting of the Knesset Caucus for the Integration of Haredim into the Labor Force and High Tech Sector on Tuesday, she referred to the necessity of providing haredi students with remedial courses in core educational topics before they can begin an academic degree.“It’s not possible to learn English or Math in a one-year pre-college preparatory course,” said Bar Shalom. “More than 50 percent of students who come to us do not succeed in English.” She continued saying that this failure caused many students to drop out of college altogether. 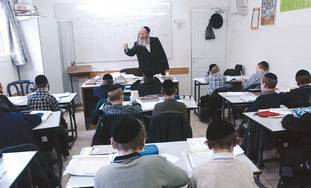 The overwhelming majority of haredi educational institutions teaching grade nine and above do not include any secular education in their curriculum at all, focusing instead on religious studies. Girls generally continue with a general education throughout their time in elementary and high school. There are approximately 7,000 haredi students enrolled in higher education programs, representing a dramatic increase over the last decade but a small percentage of the number of collegeaged haredi youth. According to a recent study by the Taub Center for Social Policy Studies, haredi employment for men has fallen from close to 88% in 1979 to 48% in 2011. The rate of employment for haredi women is approximately 61%, according to the Bank of Israel, with the national average for women standing at 66%. The new Knesset caucus was established by Yesh Atid MK Dov Lipman, who, together with MK Erel Margalit (Labor), chairs the group. Lipman said he founded the caucus because of the large high number of requests he received from haredim during the election campaign asking for assistance in matters of employment. In the previous Knesset, Yoel Hasson, a former MK for Kadima, established a similar caucus in 2012 along with several other MKs, including David Azoulai of Shas. As of yet, Lipman’s caucus does not include any haredi MK members, although he maintains he personally invited all haredi MKs to join. Amichai Katz, the administrator for the haredi sector in the Ministry of Trade and Industry, said at the meeting that nearly every week, private entrepreneurs turn to him and ask to get involved in employing haredim, because they see the vast potential in this community. He emphasized that the goal is not to change the haredi sector’s way of life but to help them with their needs.